The way your brand is represented in social media can directly impact your business. A lot of prospective customers and clients get their first peek at a business and its practices by visiting their social media accounts. It’s very important that you have the right image proportions on all your social media channels in order for your business page to convey a professional atmosphere. With 500 million active users daily Instagram is perfect for advancing your business. Unlike other social media channels, Instagram is primarily focused on using high-quality images to promote your brand. Profile Picture: 110 x 110 px. Your profile picture should either be a clear image of your brand logo, or an image representing your brand’s values. Instagram has three main image profiles: landscape, square, and portrait. Landscape (horizontal) – 1080 x 566 px. Instagram landscape dimensions recommended size: 1080 x566 px. It is also possible to use a smaller size such as 600 x 400 px. 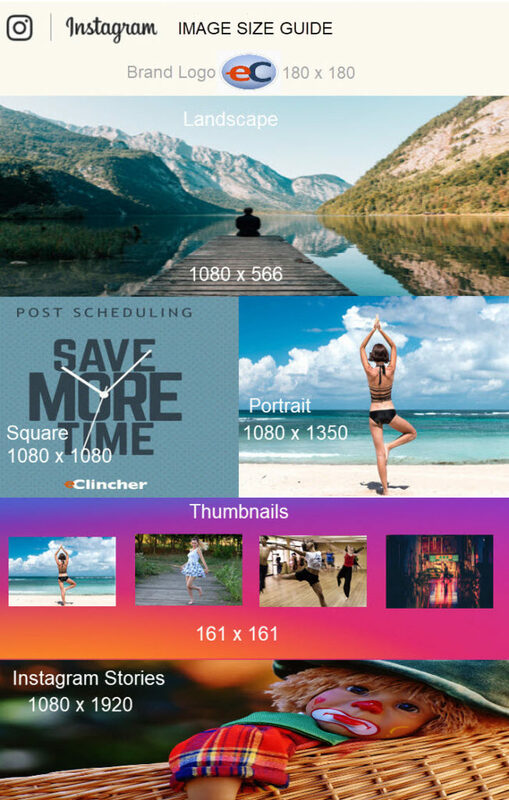 Instagram will show these images as a maximum of 600×600 pixels. Make sure to maintain an aspect ratio of 1:1, when posting a square photo. Portrait – 1080 x 1350 px. Instagram portrait size recommened 1080 x 1350 px. Keep in mind Instagram will show the image as 600 x 749 px. Photo Thumbnails – 161 x 161 px. When a visitor comes to your page they will see your images in a cascading row of smaller images called thumbnails. When someone clicks on the thumbnails the image will expand. Instagram Stories: 1080 x 1920 px. With the ability to add images or video, Instagram Stories have become an essential component of a company’s social media strategy. 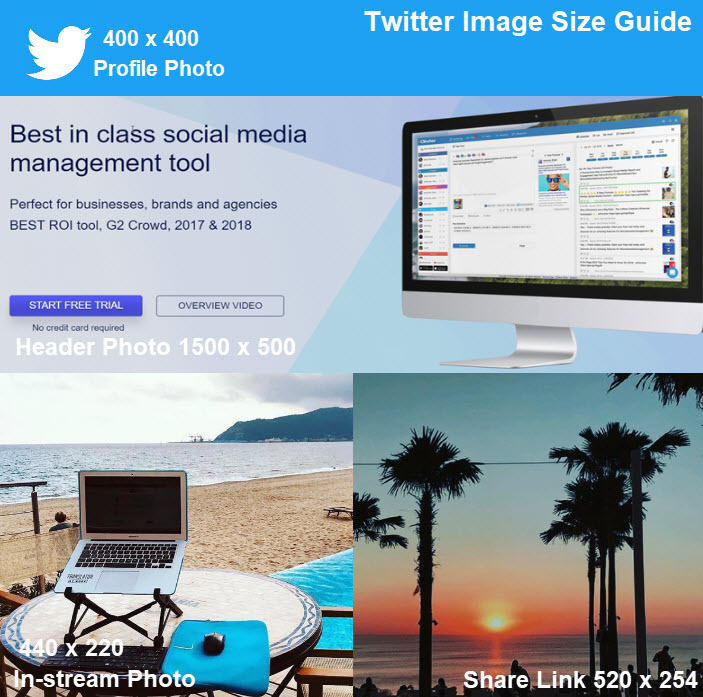 Image Guidelines – 1080 x 1920 px. 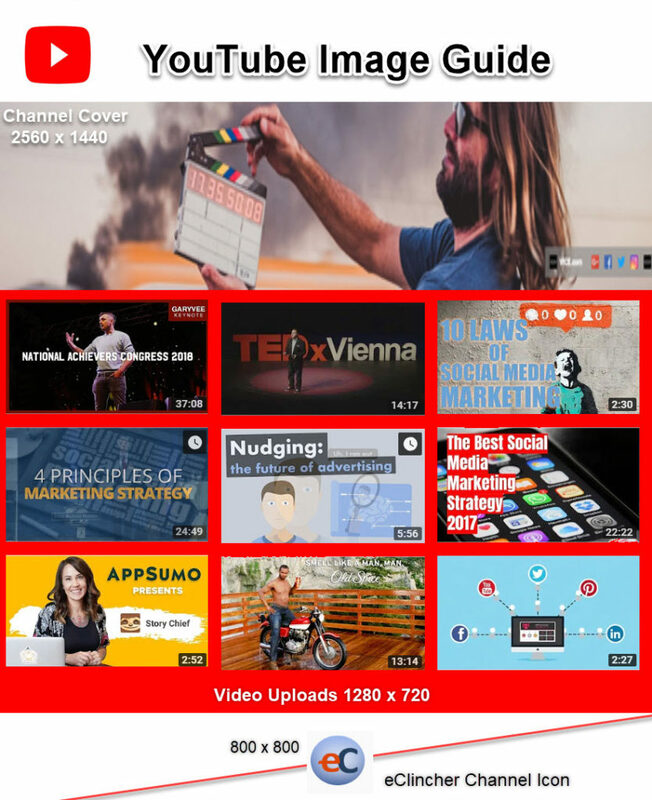 Video Guidelines – 750 x 1334 px. Facebook is the most popular social media platform with 1.32 billion daily users. Not a channel to be ignored, Facebook should form a large part of your social media marketing strategy. 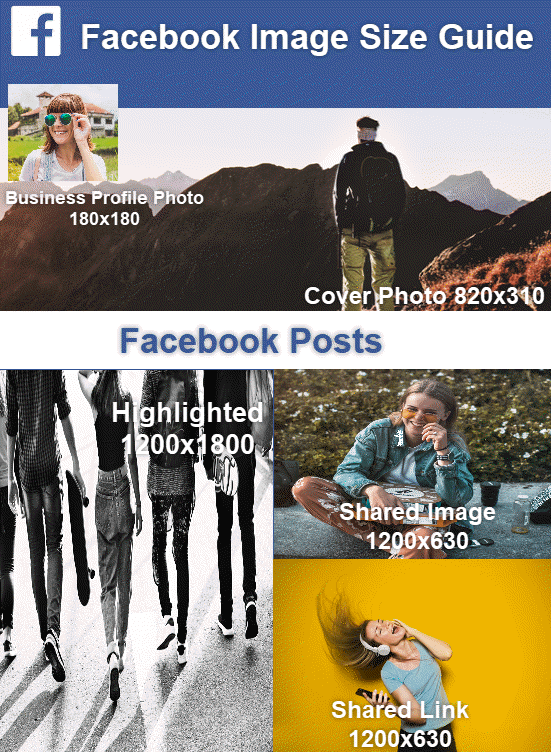 Knowing the optimal image sizes for all your Facebook posts will help you stay ahead of the competition. Business Profile Photo – 180 x 180 px. The business profile photo should represent your business ethics, a logo or an image that encapsulates your brand. Images will be cropped to fit a square. Cover Photo – 820 x 310 px. This cover photo is a large detailed image that only appears on your Facebook business page. HD photos or images that you feel outlines your brand’s mission statement work best here. Highlighted Image – 1200 x 717 px. A good way to highlight company milestones and product releases is a highlighted image, a bigger image alternative to a standard shared image. A highlighted image is a great way for a business to broadcast/promote their company achievements. The most common image form on Facebook, these images appear on your timeline and show up in your follower’s news feeds. The more that people like or comment on your post, the more followers will see that post. Shared Link Image – 1200 x 627 px. While similar to a shared image, the shared link gives you more display options. You can choose to create a shared link with a small square image to the left and text on the right or with a larger rectangular image on top with text underneath. Twitter currently has 330 million active global users, of which (according to Twitter) 80% are affluent millenials. Twitter is usually the first social media channel consumers go to discuss your brand. Since Twitter has a character limit to its’s tweets, images can speak volumes. Profile Photo – 400 x400 px. Your Twitter profile photo is visible to everyone and is you brand id on Twitter. It will be visible on your home page, and on the Twitter stream of your followers when you tweet. This image should be high resolution and represent your brand. Header Photo 1500 x 500 px. Your header photo appears on top of your Twitter profile page. It’s much bigger than your profile photo, so make sure you have a high-resolution image. The header photo is often the first thing people see when viewing your Twitter profile. So make it memorable, and in-sync with your brand. In-Stream Photo – 440 x 200 px. Twitter users can attach up to four images to their tweets. Uploaded photos will appear in your followers’ streams and if retweeted in the stream of their followers. Shared Link 520 x 254 px. A link shared on your profile will have these dimensions. Power Tip – Canva is a powerful design tool that has a beautiful image library and resizes images for all social media channels. Like Instagram, Pinterest is primarily image focused, and with 40% of Pinterest users having a household income of $100k plus that’s a lot of buying power concentrated in one social media channel. In fact, 93% of active pinners said that they use Pinterest to plan their future purchases. So it’s very important for your business to make sure you’re optimizing your Pinterest page and using proper image sizes for your boards and pins. Profile Picture – 165 x 165 px. If you are signing in with your email, upload a large square photo (Pinterest will resize it) that you feel represents your brand. 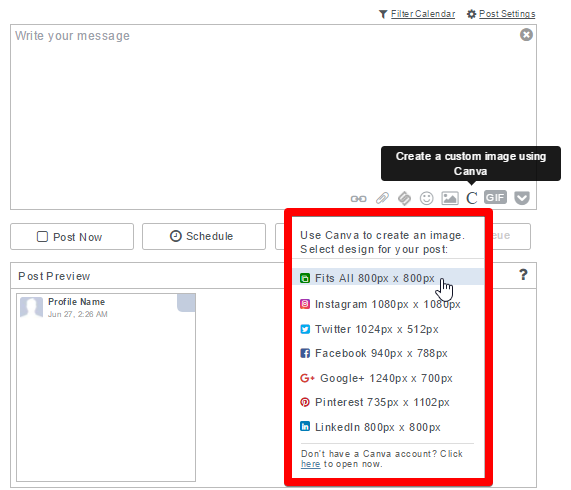 You also have the option to use your Facebook or Twitter photo as your Pinterest profile image. 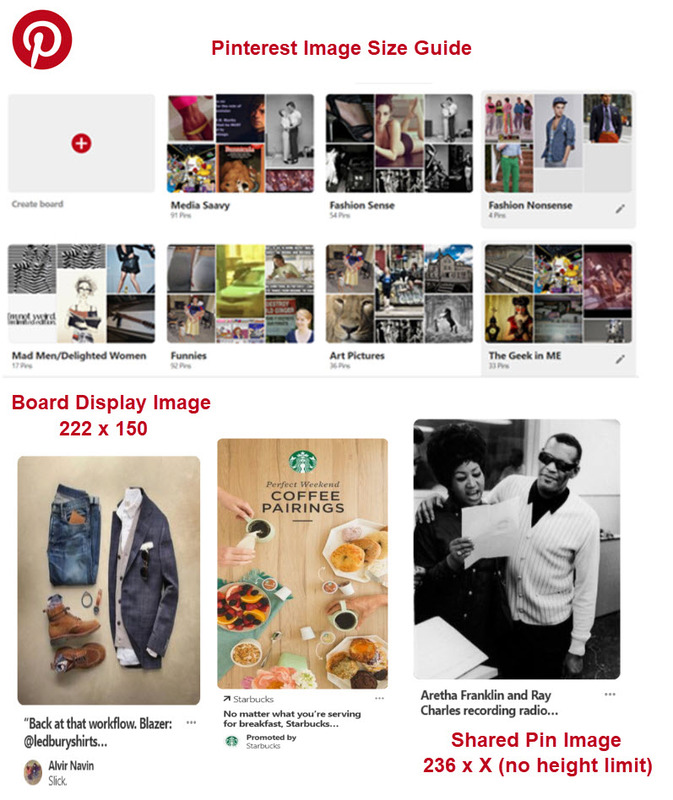 Creating boards by categories and keywords, and organizing images by these boards is an essential part of Pinterest. It’s important that these images fit the right parameters in order to look professional on these boards. LinkedIn is used primarily for businesses to connect with other businesses and influencers in the field. A great channel to establish relationships, and find brand advocates. Company Logo Image – 400 x 400 px. Your company logo that appears next to your brand name on your LinkedIn homepage. This image also appears in the “Companies you may want to follow” section. Recommended 400 x 400 pixels. Minimum 400 x 400 pixels. Company Cover Image – 1584 x 396 px. The business background image covers the entire top of the page, so make sure you pick an HD image that represents your brand. 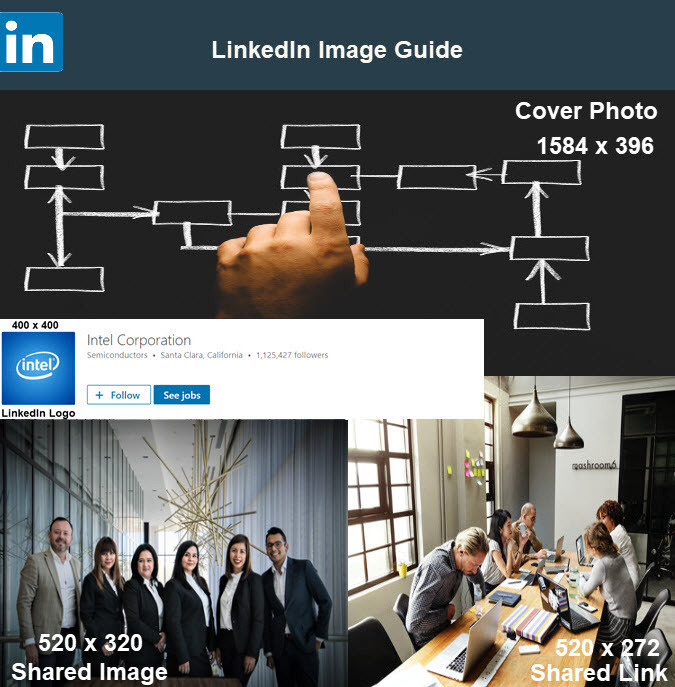 On your page or in LinkedIn boards, you can post either a shared image or a shared link. Google+ might not be the most influential social media channel, but shouldn’t be ignored because Google+ is directly tied to Google itself. When someone searches your brand, Google pulls in your Google+ account information, including your profile picture and recent posts. Making your Google+ profile look professional is important in presenting your company in a favorable light when somebody searches for it. Ties your brand to an image, when searched in Google. Though you upload your image in a square format, it’s going to render on your page as a circle. Minimum 250 x 250 pixels. Recommended to use larger photos. Maximum dimensions not listed (we were able to upload at 5,200 x 5,300 pixels). Cover Image – 1,080 x 608 px. Gives visitors a quick peek into your brand. Use a large HD image to showcase your brand and services. Recommended 1,080 x 608 pixels. Maximum 2,120 x 1,192 pixels. Unlike other social media channels, you can not only share images to your Google+ profile but indicate the circles (groups of people you group based on keywords relevant to your brand) you want to share those images with. This enables you to create posts and images catering to a certain targeted group/demographic. Maximum upload 2,048 x 2,048 pixels. Shared Link – 150 x 150 (thumbnail). Like the shared image a shared link could also be shared within circles. Unlike a shared image with a shared link you can link the image to your site or any other link you might want to share with your audience. Doing so pulls a photo from your site and adds it to the post. Shows in the feed and on page as 150 x 150 pixels (pulls in photo from linked site). Shared Video – Width 496 px. A detailed video can sometimes tell your brand’s story in more detail than the best HD images. Like shared images and links, you can share the video with your Google+ circles. YouTube has more than 1 billion unique users every month, and 400 hours of video uploaded every minute, with over a million brands on YouTube already, YouTube is the perfect social media channels for businesses to reach consumers. This image gives the audience a glance at your brand, so make sure you pick an image synonymous with your brand and its ethos e.g. brand logo. Keep in mind that it’s possible to have more than one YouTube channel, so maybe a variation of your logo to match channel contents. The channel cover photo should be a high definition image telling viewers what kind of videos should they expect to see on your YouTube channel. Note – There are a lot of different ways users can stream YouTube, so make sure your cover photo is optimized for different devices. Uploading videos are the main way for brands to connect with their audience on YouTube. Videos could be anything from product demonstrations to conference highlights, as long as they give the viewer a positive look at your business. Using the correct image dimensions for all your social media channels, and picking out enticing high-quality images that give viewers a glimpse into your business is essential for maintaining a strong social media presence for your brand. 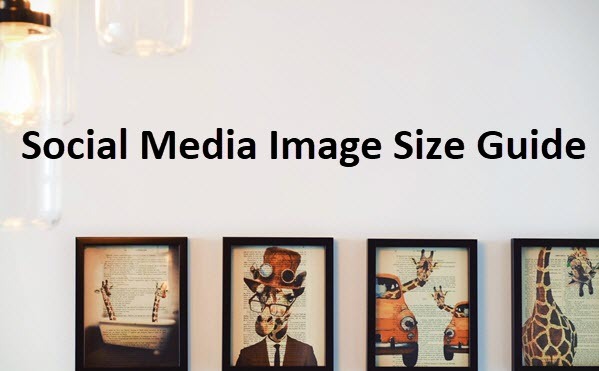 We hope our Social Media Image Size Guide for 2018 gave you the necessary info to optimize all your images.